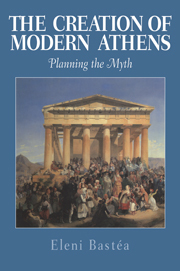 The Creation of Modern Athens: Planning the Myth is the first book to examine the urban development of Athens in the nineteenth century. Analyzing the process of architectural and urban design, Eleni Bastea reveals the multiple and often conflicting interpretations of the new city. By following two parallel processes--the building of the new capital and the construction of a new national Greek identity--Bastea demonstrates that Athens' elaborate urban design and civic architecture reflected both international neoclassical ideals as well as the national aspirations of the modern Greek nation. Introduction; 1. Athens 1834; 2. Modern Greece: between history and myth; 3. 'From barbarity to civilization': planning the modern Greek State; 4. Planning new Athens; 5. After the grand designs; 6. Building the capital; 7. Fin-de-siècle Athens.